It seems odd to be knitting winter wear in the summer, but I'm loving sitting on my porch knitting up a few rows/rounds. 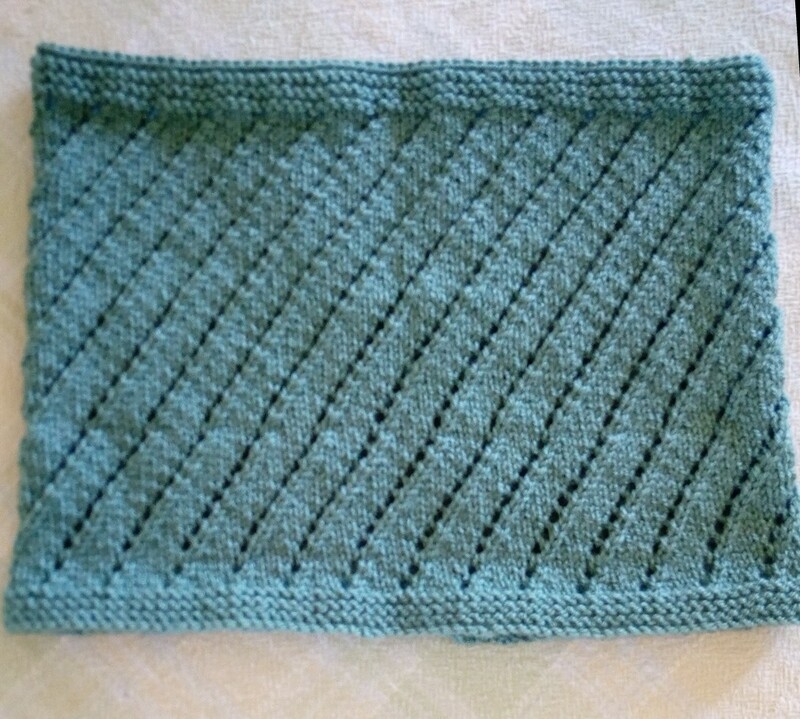 This Spiral Eyelet cowl was a delight to knit with the Paint Box Simply DK. The 4 stitch sequence was easy to remember. I loved the cast off technique which was new to me. It's called the elastic cast-off. I like how it has a slight stretch. 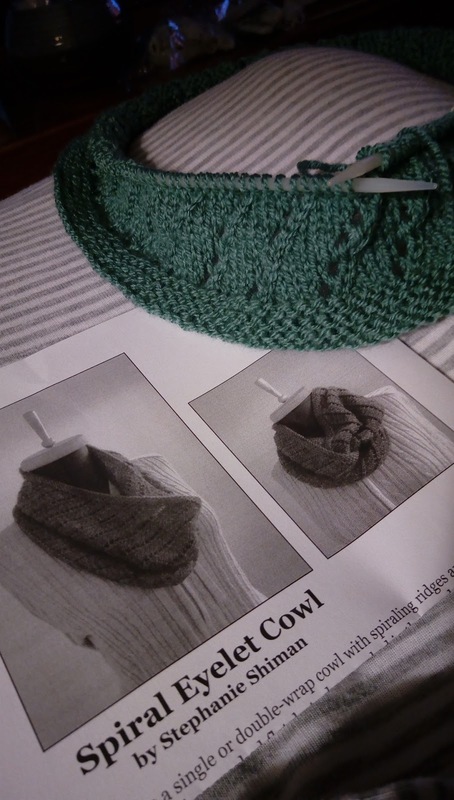 I'm contemplating how to block the cowl. I will research later on how the best way to do it is. This shawl will take me longer to knit of course, because it's a bigger project. I'm looking forward to see how this turns out. And just so you know, I haven't abandoned my sewing totally this summer. Stay tuned and in a few days I'll show you some of the things that I've been sewing. 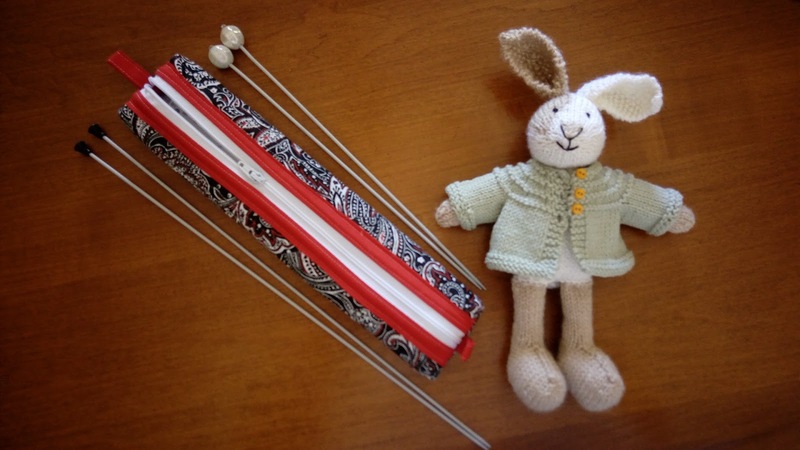 When I started to knit the little bunnies, one of the sizes of straight knitting needles I needed was a 2.50 mm. It's quite small. Turns out they are harder to find than you might think. While popular in the UK, they are not that popular here, and non-existent in the USA. Even look at my needle gauge, there's no size for 2.5 mm. So I ordered mine online. The only length they had was 14 inches long. Now these little bunnies have many parts, and the most stitches that I cast on is 30 or 35. So 14" needles is way overkill. I really want the 10" ones if they can be had. It just so happens that the dollar store here had some 2.5 mm needles. I bought a set and tasked my husband to shorten them. All he was able to do was cut them off, but had no way to save the ends. He suggested I glue a bead on the end. Brilliant... 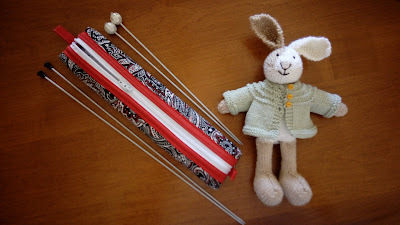 I did, and now I have a set of short 2.5 mm needles that fit in my little needle case. I have had fun this past week (or two) doing research on Ravelry. It's hard to know when to stop researching, and start knitting. I have found at least 15 perfect projects that I want to knit and my must-knit list has grown exponentially. 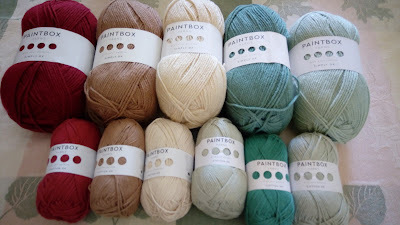 But my research this week was intended to find projects to use my gifted-to-me Paint Box Yarns. 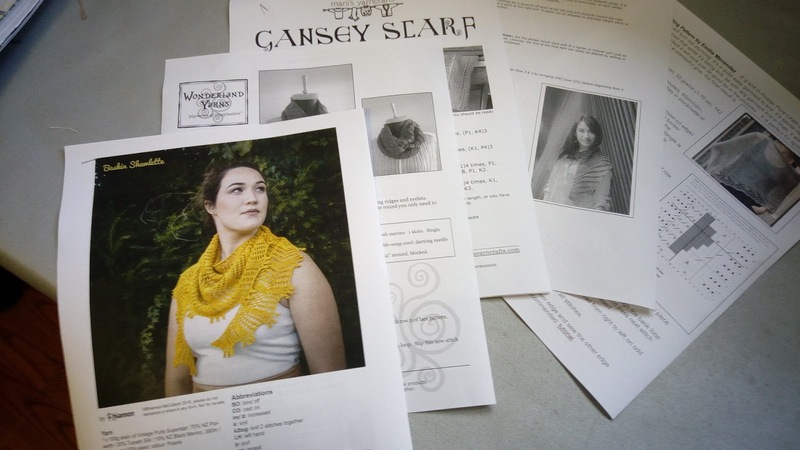 I want to knit a shawl type of scarf. I'm down to 6 or 7 choices. I'm in a delema, rectangle, or triangular. I can't seem to make a decision. While I ponder my delema, I decided that I really need to stop researching, and start knitting. I'll start with a cowl. I've been wanting to do a spiral cowl for a while, so this was an easy decision. 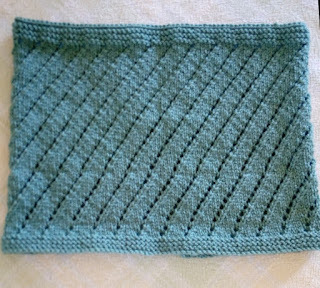 I chose this Spiral Eyelet Cowl pattern because the spiral is clear and not complicated. But, after reading the pattern, I could not understand how that spiral design could happen/develop with the two-row repeat. I thought for sure it would be a 10-row repeat. How does the eyelet spiral? Well, I just started to cast on, and I figured once I start knitting, I'll figure it out. I still haven't figured it out, even after knitting 5 repeats of the two rows. But I am liking the look and it's easy to knit while watching TV. The Paint Box Simply DK yarn is very soft and is perfect weight for my size 4 mm 24"circular needles. I will definitely get this cowl done out of one of the 100 gram balls of the Simply DK. I hope to have a shawl/scarf decision made by the end of the week. Stay Tuned and Happy Stitching.. I really enjoyed my knitting in the park experience this week. Aurora had a great time at the park with the day camp folks. 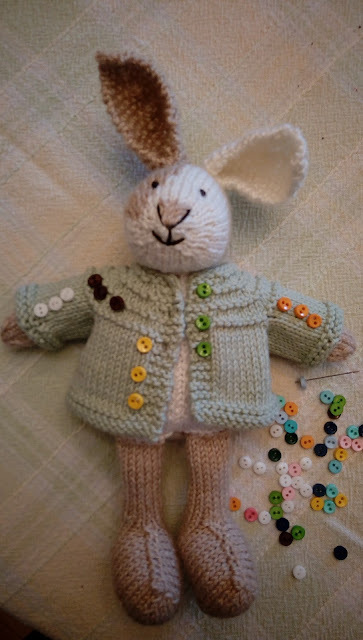 During all this, I sat slightly in the shade and worked away at the little sweater for the Bunny. I never realized how bright light can make knitting so much more pleasurable. The little bunny sweater is done. 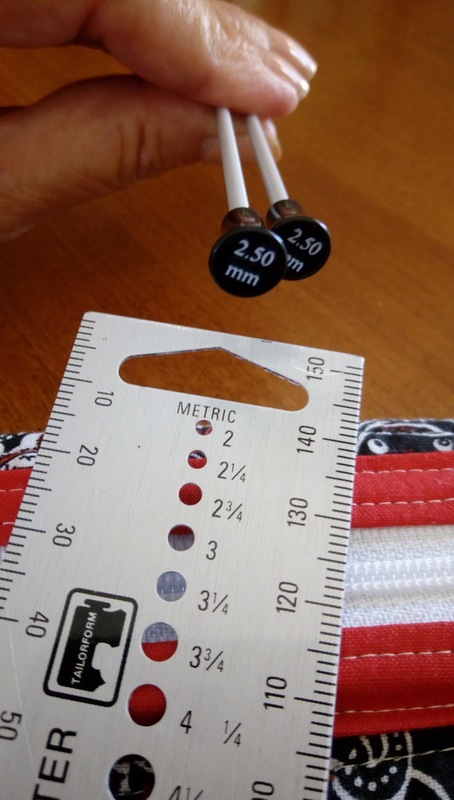 The final step is to sew on three little buttons. The hard part is to choose a button color. White, black, yellow, green or orange. What would you pick? When I saw this fine cotton yarn, I knew exactly what I was going to knit. This little piebald bunny, that I knit this spring, needs new clothes. She needs a red dress and a light green sweater. The dress pattern and the sweater pattern calls for cotton DK yarn. 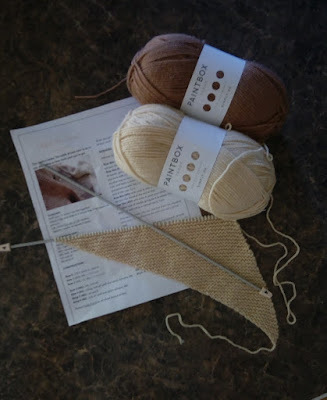 I've never tried the cotton DK before, so now is a good chance. Today, I have an hour to knit in the bright sunshine in a park. This is a totally different spot for me to knit, but I'm looking forward. 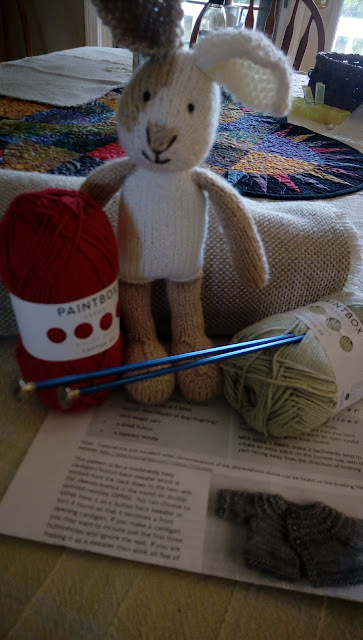 See, Miss Aurora is visiting and she's attending a morning craft camp and I'll be nearby starting my little bunny sweater. I'm anxious to see how much I can get done at the park. Where do you Love Knitting? LoveKnitting.com thought they'd like to work with me by sponsoring some of my knitting. It's the best kind of partnership. They provide the yarn and I knit what ever I want to!! Awesome! I didn't know what yarns they were sending me so waited until I received the yarn to research what I would knit. Well, I received the yarn and was I ever delighted! The yarn is the Paintbox brand. I've seen it advertised but never had the opportunity to use it. They are two different lighter weights of yarn. One is 5 shades fine DK cotton yarn and I know what I'm going to knit with it. I'll share in a few days once I get started. The other is 5 shades of 100 gram Double Knitting (DK), that use a size 4 mm knitting needle. That's my favorite size needle. I do have a few small things on my knitting to-do list, but I've been having fun searching through Ravelry's and Loveknitting.com's patterns, for projects that would be perfect. I've got it narrowed down to a poncho, shawl or shawlette. I have a dozen patterns flagged. Now, from that dozen, it's a matter of looking at the patterns to make sure there's nothing too complicated. I'll narrow it down to my top three soon. For now, have a look at these yummy skeins of yarn. In a couple of days, I'll share my top three shawl designs, and ultimately the one I've chosen. 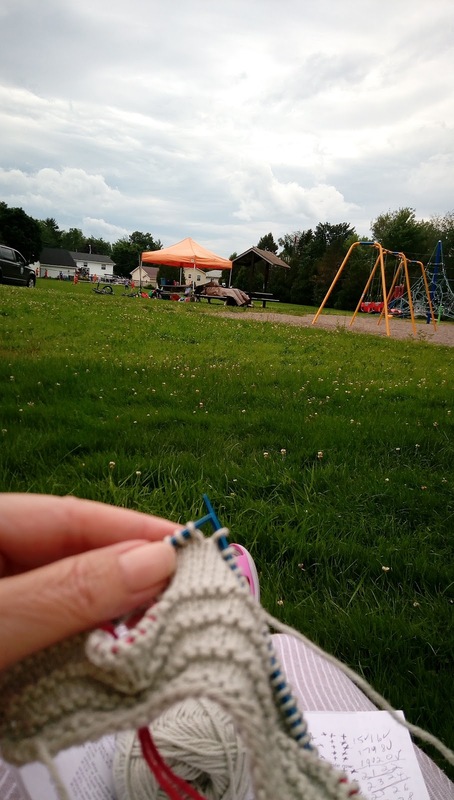 Thanks Loveknitting.com for making my summer knitting more interesting. PS: I Love Knitting on the couch while watching TV. Where do you Love Knitting?